Dr. Metka Stare (a research councillor at Centre of International Relations – CIR) and prof. dr. Dejan Križaj published a chapter titled ‘Crossing the Frontiers between Touch Points, Innovation and Experience Design in Tourism’ in an Elgar Publishing publication about Services, Experiences and Innovation edited by assoc. prof. dr. Ada Scupola and prof. dr. Lars Fuglsang. The book focuses on service innovation and consumer experience research. Split into clear and thematically separate categories, the contributors explore systemic innovation, practice-based innovation, technology and innovation, and experiences as a catalyst for innovation. Examples are taken from the tourism industry, entrepreneurial ventures, online gaming and digital services, to provide the readers with a thorough overview of the extensive impact of these innovations. Using organisational, systemic, conceptual and empirical examinations of the experience and service economies, the authors identify how top class innovation research can be extended and integrated further with other research areas. 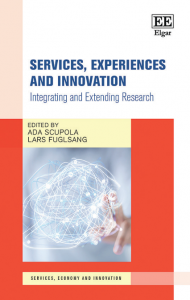 In their chapter, dr. Stare and dr. Križaj focus on the innovation process in tourism (acknowledging the interconnectedness of products, services and experiences in the latter). One of the recently proposed approaches to the innovation process relates to broadly defined innovation and experience design aspects with touch points (Experiences through Design, Innovation and Touch points – EDIT). This approach suggests that experience of the customer at each touch point brings value and should thus be included into the innovation design process. The chapter scrutinises innovations recently awarded by a national tourism innovation-supporting mechanism through a case study analysis which evaluates the applicability of the EDIT model for a more holistic understanding of the new realities at the ‘innovation crossroad’. More information about the publication is available here.